Publisher Description: Dune collects, for the first time, the sand dune photographs of both Edward and Brett Weston, two giant names in modern photography. Previously, their remarkable dune photographs–dramatic abstractions of light and shadow and sensuous shape–were featured as samples in overview publications on the artists, just a picture here and there. This lush volume brings together father and son in a personal, unique fashion, showcasing the photographs each made in the same locations. Adding depth is an original essay by Brett Weston’s longtime friend, traveling companion and biographer, John Charles Woods. Woods’ intimate, forthcoming narrative describes what it was like to accompany the younger Weston into the dunes and what his habits and personality were like. Charis Wilson, Edward Weston’s one-time wife, excerpts a passage from her acclaimed book Through Another Lens, in which she tells of a 1936 trip she and her husband made to the dunes of Oceano, California. 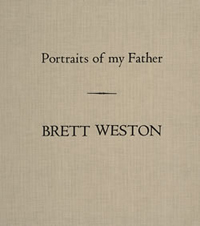 Also included are correspondence between father and son, and excerpts from Edward Weston’s daybooks. 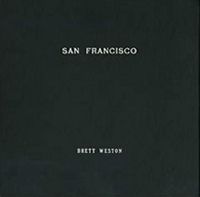 Lodima Press proudly announces a landmark publishing event in the world of fine photography books: San Francisco, the first in a nineteen-volume series on the portfolios of Brett Weston. Each book in the series will be published in a softcover edition of 1,000 copies and a hardcover edition of 100 numbered copies. Published in 1939, the ten photographs in Brett Weston’s San Francisco portfolio were offered for sale at a price significantly lower than if each of the photographs were purchased individually. The market for fine photographs was over thirty years away and Weston sold only three portfolios. And because most of the photographs that were included were never printed again, this is a side of Weston’s oeuvre unknown to all but a few. The original White Sands portfolio, produced in 1949, contained twelve photographs and was printed in an edition of fifty. In 1975 Weston printed a second edition of the portfolio in an edition of seventeen. It included eight of the original ten photographs made in the 1940s (negatives from two of the photographs in the original portfolio were damaged and unprintable), two others from the 1940s that had not been included in the first portfolio (Plates 11 and 12), and two from 1975 (Plates 13 and 14), for a total of twelve prints. 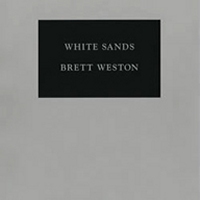 White Sands contains the original ten photographs plus the four new pictures from Weston’s 1975 edition. The original 1949 title page and the introduction by Nancy Newhall are reproduced in facsimile. Included is an afterword by art historian Roger Aikin. As a bonus, we have included an additional photograph along with a facsimile reproduction of Brett’s letter describing the picture as “Edward’s favorite.” Although it was not included in either of the original portfolios, Brett included it as a gift with the portfolio from which this book has been reproduced. The New York portfolio was produced by Weston in 1951. 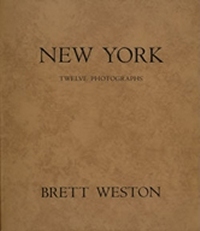 It contains Weston’s photographs of New York from the 1940s—photographs that contrast with his photographs of San Francisco and evidence Weston’s growth as a photographer. The original 1951 title page and the introduction by Beaumont Newhall are reproduced in facsimile. Included is an afterword by art historian Roger Aikin. 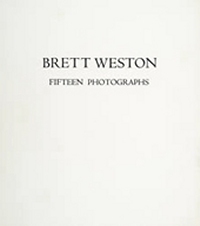 Brett Weston’s fourth portfolio, Fifteen Photographs is the first not tangibly “located” in place or time as is San Francisco, White Sands, and New York; rather, it is, in effect, a retrospective exhibition because Weston selected the photographs from his entire oeuvre going back to 1934, when he was just twenty-three. The fifteen pictures include macrocosmic landscapes with recognizable deep space and horizons, microcosmic landscapes, or “elegant bits” of nature, as Brett was fond of calling them, and man-made subjects that are usually close-ups. This portfolio also contains a number of renditions of virtually flat subjects that can rightly be called abstractions. The original portfolio included no printed text. The book contains an afterword by Roger Aikin. The ten photographs in this portfolio are contact prints from 11 x 14 -inch negatives, the largest format Brett Weston ever used, and the largest practical format for any but the most ardent devotee of view cameras and contact prints. Brett employed this camera between 1944 and the early 1960s, when he realized that new medium-format roll-film cameras like the Rollei SL66 (which made relatively small 2 1/4-inch square negatives), were so good that he could abandon contact prints altogether. By 1963, Weston felt confident that he had enough 11 x 14 prints to select ten pictures that fit his criteria for a portfolio-quality, variety, unity, and ease of printing-and since he did not use the 11 x 14 camera after this time, he may have intended this portfolio as a farewell to the big camera itself. Like his previous portfolio, Fifteen Photographs, the title Ten Photographs is neutral, and the portfolio has no text or predetermined order. As a group, these pictures are quieter, more relaxed, and somewhat less shocking or abstract than his previous portfolios, perhaps because of the limitations of the camera. Brett Weston first picked up a camera in Mexico as a fourteen-year-old when he spent several months there with his father Edward in 1924, and Baja California, made between 1964 and 1967, demonstrates his love of Mexico and its unique light and natural forms. The Baja portfolio has no text or picture titles and no predetermined order, but the pictures in this portfolio, like those that came before and after it, were carefully selected from hundreds of photographs for their variety and continuity: Baja contains four relatively deep-space landscapes with horizons, one medium close-up, and several relatively flat and abstract close-ups of sand, rocks, water, and plants. The term “lyric” is usually understood to refer to poetry that is meant to be sung out loud, but it can also be applied to artworks in any medium that have musical or rhythmic qualities. These photographs are the most “lyrical” group Brett had created to date, and they pulsate with joyful, organic rhythms. 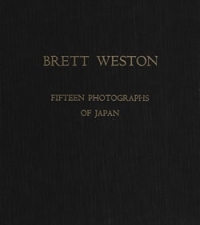 Weston visited Japan only once, in 1970, and produced the Japan portfolio that same year. Besides new subjects and textures, he was obviously fascinated with Japanese architecture, design, and calligraphy, and he seems also to have absorbed something of the style of Japanese art. For example, in contrast to conventions of perspective in Western paintings, which tend to move horizontally and employ a single vanishing point, Japanese (and Chinese) landscape paintings tend to move or “read” from top to bottom (as does Japanese writing), and to employ ichnographic perspective, which has no single vanishing point and also implies a distant point of view. Weston seems to give a nod to this Oriental aesthetic with the five landscapes he includes here. . . . In other words, Weston’s personal artistic interests seem to mesh with the Japanese environment and the style of Japanese art. He was clearly fascinated with the new shapes and textures of Japan, and he rhymes these shapes and textures across the portfolio. 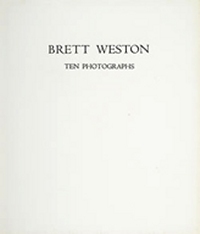 Brett Weston made these twelve photographs during several trips to Europe, the three photographs from 1960 with an 8 x 10 view camera, the rest in the early 1970s with a Rollei SL66, a camera that facilitated Weston’s natural development towards the abstraction and two-dimensionality that mark his later work. 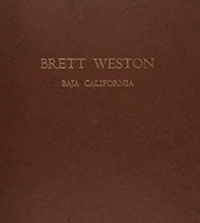 Weston dedicated this portfolio to his great friend and patron, Merle Armitage (1893 – 1975), a self-educated jack-of-all-trades and impresario who co-founded the Los Angeles Grand Opera Association, managed the Philharmonic Auditorium in Los Angeles in the 1930s, and invented the Hollywood Bowl. More important for photography, Armitage was president of the American Institute of Graphic Arts and art director of Quick and Look Magazine as well a book designer and author with over one hundred books to his credit. Many of the books he wrote or designed featured the artists, composers, and performers with whom he was associated. He published the first important books about both Edward and Brett Weston and was their lifelong patron. Armitage was still a blur of energy and much in demand as a speaker well into his late seventies. Gerald Robinson, who wrote the introduction, is an attorney, photographer, and patron in Portland, Oregon, who knew Weston well and often entertained and photographed with him in Oregon. 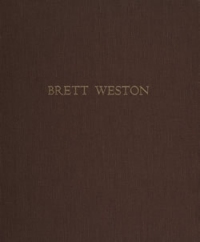 Robinson is also a gifted writer and critic, and his unpublished essay on Brett Weston contains important information and perceptive observations about Weston’s life and work. Weston’s next portfolio, Oregon, of 1975, was dedicated to Robinson. In 1975 Brett Weston was sixty-four years old and had been making photographs for fifty years. He had married and divorced for the fourth and last time, his daughter Erica was grown, and he had achieved international recognition and considerable financial security. Oregon photographers are well aware of the great diversity and visual possibilities in their native landscape. 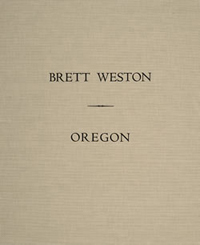 Weston fell in love with Oregon in the late 1960s and made several close friends there, especially Gerald Robinson, who wrote the introduction for Weston’s Europe portfolio of 1973 and to whom this portfolio is dedicated, and Bernard Freemesser, who wrote the introduction for his Oregon portfolio. The Oregon portfolio exemplifies Brett Weston’s unique vision at the height of his powers. His subjects are familiar-water, ice, metal, rocks, sand, and trees-but their treatment is mysterious, unexpected, free, and joyful. 10 Photographs made from 1929 to 1942.